How to find out, who retired from the contacts? Each user's contacts are fewer than a small (or large) a list of friends and subscribers. Good, when friends recorded twenty people, you can track the movement of, removal and news to its subscribers. It is more difficult to conduct personal statistics, having friends list thousands of names and nicknames. to learn, who retired from the contacts, who added your page to read, or who created the group, you can synchronize buddy lists in Excel table. The method of verification lists of friends through Excel requires perseverance and some time. As sun-two. At this time, you accumulate information, copying from the clipboard to your friends list, and inserting it into an Excel spreadsheet. for example, today the first list is added to the table, saved file. After a couple of days to add the same table a new column in the current list of friends, reading your page. Now you can compare the two columns. To do this, use the Excel VLOOCUP(). to learn, who retired from the contact for this week, the first spare column cell paste formula: =VLOOKUP(A2;$B$2:$B$11;1;FALSE). Hit enter. At the bottom of the page a list of remote users will be displayed. To calculate the amount to add to your user page, using formula: =VLOOKUP(B2;$;$A$2:$A$11;1;FALSE. Keep in mind, this formula in Excel is not running Russian language. If you do not know how to use Excel, and you do not know, how do you know who went out of contact, who add to your subscribers, Consider the possibility of a special offer from the social network VK. This application is called “My friends”. 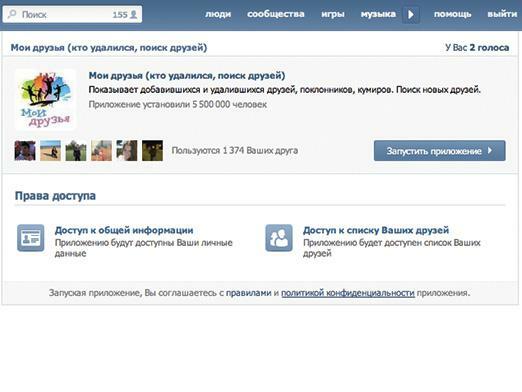 It is available at http://vkontakte.ru/app662272. Everything, you have to, come into this application to compare columns with lists of friends on a daily basis. Just like that, and most importantly – fast, You can solve the problem: how to find out, who retired from the contacts, continuing to carry out their page and taking care of its popularity among social network users.